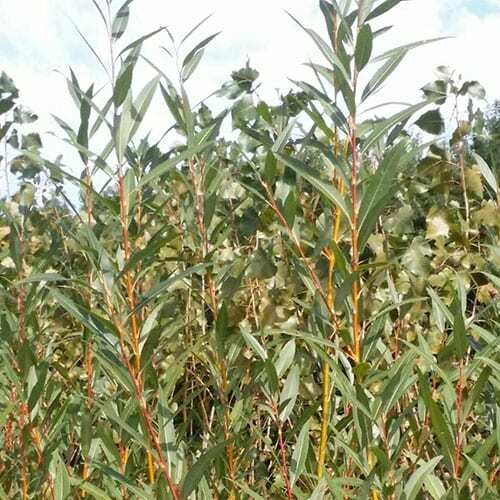 ‘Britzensis’ is an all-male white willow cultivar which is most noted for the fact that its new growth stems turn red to orange-red in winter. In order to maximize this red stem effect, this plant is often grown as a multi-stemmed shrub with the branches being cut back heavily each year in late winter to about 1′ from the ground before new growth appears. Plants are fast growing and can usually produce 6-8′ of new growth in one growing season. Sometimes also grown as a tree and pollarded (branches are annually cut close to the trunk in late winter to promote dense growth of new stems) as a way of promoting best red stem growth and showcasing the same. If not pruned severely, ‘Britzensis’ can eventually mature into a large shrub or medium size tree. Very narrow, lance-shaped, finely-toothed leaves (to 4″ long) are light green above and silver green below, turning variable shades of yellow (usually attractive) in autumn.